The Developer Preview build of Windows 8 was released was just yesterday and we’ve come across quite a few people who actually want to have some of Windows 7’s features on Windows 8. One such feature is the classic Start Menu, which is quite dumbed down in Redmond’s new OS. We’ve got hold of an app which solves this issue, you can read about it after the jump! Developers by Solo-Dev of DeviantArt, all this little app does is bring back the ‘Classic’ Windows 7 Start Menu with the click of a virtual button. My first Windows 8 app! 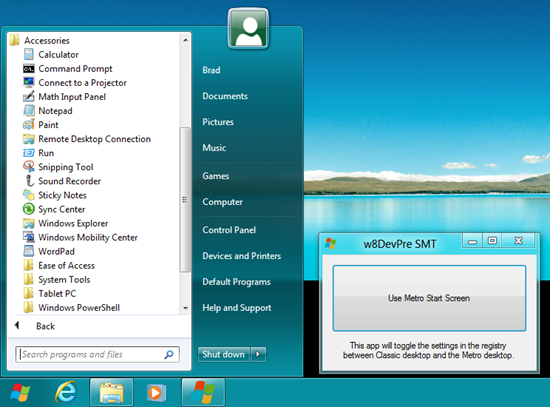 It allows you to toggle between the Metro Start screen and the Classic start menu in Windows 8 Developer Preview. Feel free to share it to other websites! We have personally tested the app on a fresh installation of Windows 8 Developer Preview and can confirm that it works as claimed. Once installed and launched, you simply click on Use Classic Start Menu and the app enables said menu on your fresh installation of Windows 8. In order to go back, you simply click on Use Metro Start Screen. Before the app existed, there was a manual hack floating around which involved changing a value in the Windows registry. While it wasn’t very tricky, Start Menu Toggle just wraps the hack in a user-friendly, one-click interface that I’m sure users of Windows 8 Developer Preview will love. Microsoft has reportedly removed the option to enable the Classic Start Menu on purpose in order to get developers to use the new UI for developing their future apps for Windows 8. Chances are, Microsoft will include said option when Windows 8 releases sometime in 2012. If you’re interested, you can download the application from the link embedded below.